The market for Aboriginal art has had a tough time of late as the cautious buying activities of collectors and investors allude to a market in a state of suspended animation that is struggling to establish a new identity in the wake of a series of events that have impacted heavily on people’s confidence in the work of Aboriginal artists. If recent events are anything to go by, however, that new identity may be already on its way. The results of the most recent major auction of Aboriginal art held by Deutscher and Hackett on the 4th of April suggest strong interest in the more minimalist geometric style, traditional motifs and natural earth pigments of early bark paintings and decorated ceremonial objects. One of the highlights of the sale was the $18,000 achieved against an estimate of $8,000 – 12,000 for a painted hollow log by the internationally renowned artist Gulumbu Yunupingu. Also going to new homes were more traditional works on bark and wood by the likes of Ivan Namirrkki, Owen Yalandja, John Mawurndjul. 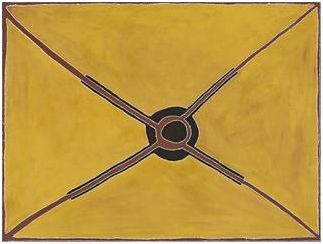 The top price of the auction went to another more traditional minimalist work painted using natural earth pigments by Rover Thomas titled Warringarri - The Meeting Place which sold for $108,000 against an estimate of $100,000 – 150,000. 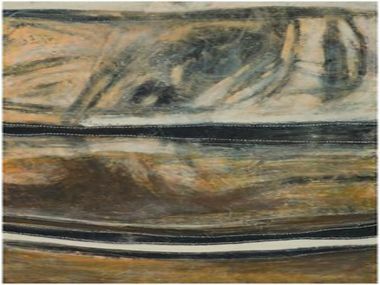 Another similar Thomas painting sold for $30,000 which was followed two lots later by the sale of yet another minimalist natural pigment painting by Paddy Bedford which fetched $48,000. One of the surprise successes of the Deutscher Hackett sale was beautiful work by the late contemporary artist Shane Pickett (1957 – 2010) whose more contemporary utilisation of traditional colours and motifs fetched $28,800 against an estimate of $8,000 – 12,000. In a positive sign for the market, the work of Gunybi Ganambarr, a young Aboriginal artist who experiments with the use of traditional motifs and colours in a more contemporary context, has found favour with collectors. A progression of the work of artists such as Yirawala, John Mawurndjul and Samuel Namunjdja, Gunybi Ganambarr’s paintings combine ancient traditions with contemporary materials such as rubber, metal and pvc to startling effect. One can only hope that more artists follow in the footsteps of artists such as Shane Pickett and Gunybi Ganambarr. Although Ganambarr has yet to establish a secondary market presence, the interest being shown in his work is sure to lead to future auction sales.